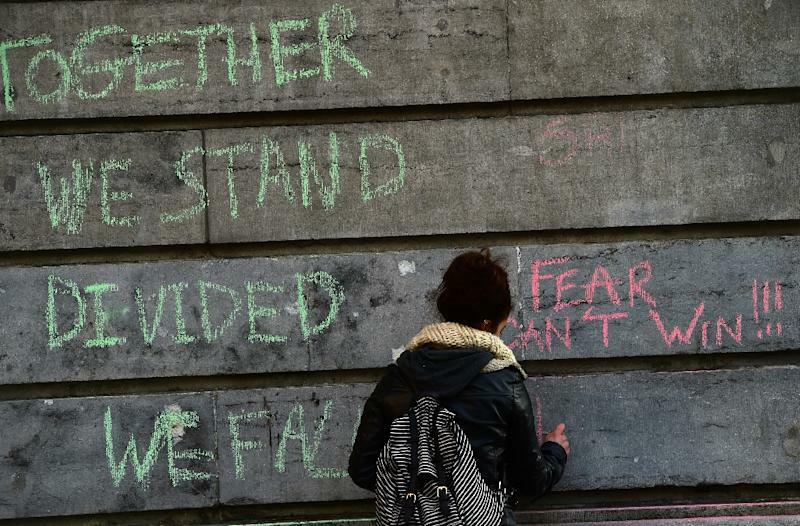 Brussels (AFP) - World leaders united in condemning the carnage in Brussels and vowed to combat terrorism, after Islamic State bombers killed around 35 people in a strike at the symbolic heart of the EU. 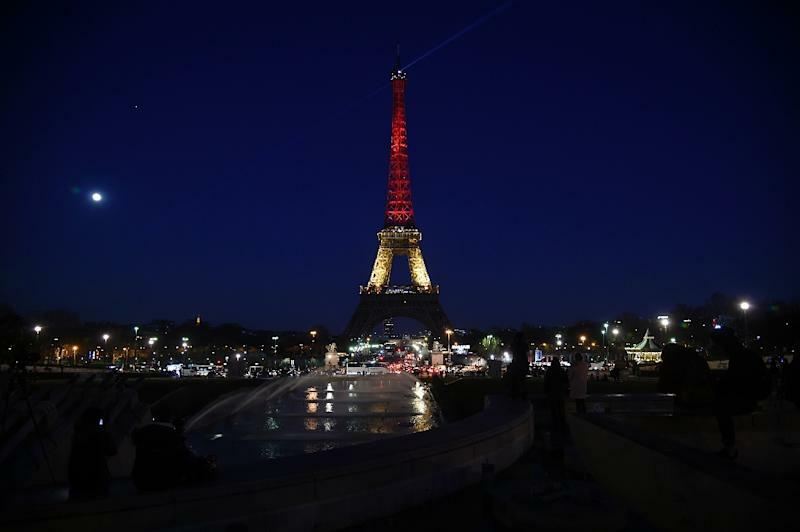 Global landmarks from the Eiffel Tower in Paris to Berlin's Brandenburg Gate were lit up in the black, yellow and red of the Belgian national flag in solidarity. In Brussels, hundreds crowded into Place de la Bourse in the capital's historic centre to grieve for the dead, while in London fans of Adele lit up the O2 stadium with their phones after the pop star asked them to "take a moment for Brussels". The European Union vowed to defend democracy and combat terrorism "with all necessary means" after the bombings at Brussels airport and a metro station, only a short walk from the bloc's core institutions. The EU said the Brussels attacks were an assault "on our open democratic society" at a time when the 28-nation group is already on edge after a wave of jihadist violence. "This latest attack only strengthens our resolve to defend the European values and tolerance from the attacks of the intolerant. We will be united and firm in the fight against hatred, violent extremism and terrorism," said the statement by the leaders of the EU's member states and its institutions. Officials said around 20 people were killed on the metro and 14 at the airport in the rush-hour assaults, which came days after the main fugitive suspect in November's gun and bomb rampage in Paris was arrested in Brussels. "Our Union's capital is under attack. We mourn the dead and pledge to conquer terror through democracy," the Greek foreign ministry said on Twitter. "Nous sommes tous Bruxellois" -- "We are all citizens of Brussels." Belgian colours lit up the Eiffel Tower in Paris, and hundreds joined a vigil in support of the Brussels victims. Flags were to fly at half mast in France, a nation still raw from last year's jihadist rampage. 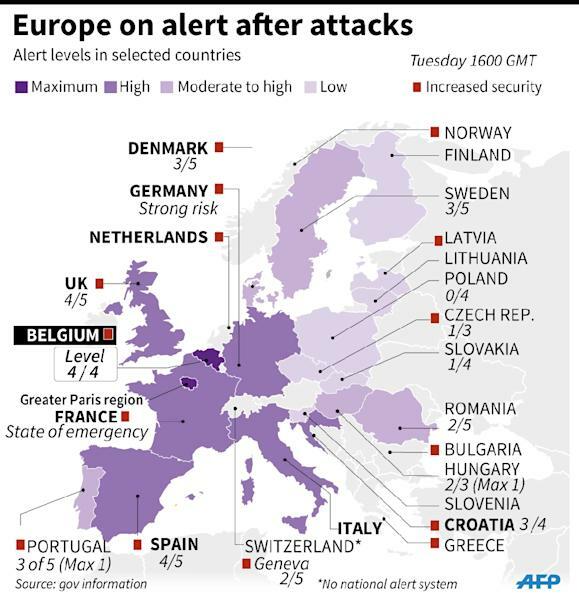 "The whole of Europe has been hit," French President Francois Hollande declared, urging the continent to take "vital steps in the face of the seriousness of the threat". German Chancellor Angela Merkel vowed that "the horror is as boundless as the determination to defeat terrorism" and British Prime Minister David Cameron vowed: "We will never let these terrorists win." US President Barack Obama branded the attacks "outrageous", calling on the world to stand "together regardless of nationality or race or faith in fighting against the scourge of terrorism". "We can and we will defeat those who threaten the safety and security of people all around the world," he said in Havana. UN Secretary General Ban Ki-moon said he was confident "Europe's commitment to human rights, democracy and peaceful coexistence will continue to be the true and lasting response to the hatred and violence of which they became a victim today". And Prime Minister Malcolm Turnbull of Australia, which has been combating threats from homegrown jihadists, said his country was "absolutely shoulder to shoulder with Belgium". He told the ABC: "Australia is allied with Belgium in this battle just as our forebears were 100 years ago in the fields of Flanders, in the First World War." Turkey, which has seen hundreds killed a wave of bombings blamed on IS as well as Kurdish rebels, said the Brussels attacks rammed home the need to combat terrorism of every hue. "The terrorists who targeted Brussels... are showing once again that they respect no value nor any human and moral limit," President Recep Tayyip Erdogan said in a statement. Russian President Vladimir Putin, whose country was left reeling after a Russian plane was downed by a bomb over the Sinai in October that killed 224 people, also lashed out at what he called "barbarous crimes". "Fighting this evil calls for the most active international cooperation," he added. Religious leaders also spoke out against the attacks, which Pope Francis described as "blind violence". In Cairo, the leading seat of learning in Sunni Islam, Al-Azhar, said the blasts "violate the tolerant teachings of Islam" and urged the international community to confront the "epidemic" of terrorism. The attacks also reverberated in the US presidential campaign, where Republican front-runner Donald Trump said the cause of the bloodshed was "no assimilation" by immigrants. "This all happened because, frankly, there's no assimilation." Thousands took to Twitter to express their own anger at Muslims using the #StopIslam handle, in comments rejected by other web users as Islamophobic and racist.